How Can Smart Phones Work With, Not Against, Your Event? Smartphones can be the ultimate distraction in our relationships, work productivity, and even our ability to enjoy social settings. While our smartphones have unlocked tremendous potential for marketers, they also present a unique challenge for event planners: How to utilize smartphone technology to enhance an event, as opposed to the phone being a distraction to attendees? Have you ever been to a wedding and everyone is complaining that it is either too cold or the music is too loud? A skilled event planner springs into action and responds to the crowd consensus by making immediate adjustments. Through social listening, a planner can monitor digital conversations to understand what attendees are saying about their event. This is particularly useful for conference planners who have a longer period of time to adapt to attendee interests. For example, if a particular speaker received rave reviews, perhaps give them more stage time; if the same question keeps popping up about a product, be sure your next speaker leads their session with the answer. Facebook recently changed their news feed algorithm to favor content posted by friends and family, as opposed to brands and news outlets. Event organizers can now either boost their posts’ reach to spread the message about their event or create unique moments their attendees will want to share with their network for free. Most organizers are designing a space, beyond your usual step-and-repeat, where attendees will take pictures to post with a designated hashtag. At large-scale events, we’re seeing flower walls, grand balloon presentations and people in costume. At house parties and school functions, hosts are creating their own Instagram stations with streamers and props, so each partygoer has a great photo op for social media. Live videos also seek to capture key moments at parties, conferences and festivals. Think of the many shaky videos you’ve seen from Beyoncé’s performance at Coachella, keynote speakers or school dance recitals. By creating WOW moments, attendees want to show they were a part of this special experience and will amplify your message for free. Understanding your attendees interests and their personas is key to creating a content calendar pre and post event. RSVP lists aren’t just for headcounts. They reveal the type of content connected to your event, your attendees will want to read and share. For example, if your organizing a food expo, you may want to schedule blog posts featuring recipes using some of the products that will be showcased, live video streams of cooking demonstrations from scheduled speakers and webinars with your main sponsors. This featured content creates momentum leading up to the event, while adding an additional benefit for speakers and sponsors. Program booklets and paper surveys are slowly becoming signs of an antiquated event. With a dedicated mobile app, event planners can receive instant feedback from surveys, provide real-time information to attendees and steer guests to specific conference sessions and sponsor booths through contests. With all event information housed in one place at the fingertips of your guests, it will be easier to organize and disseminate information. The more tailored the experience is for your attendees, the more engaged they will be with the app and your overall event. 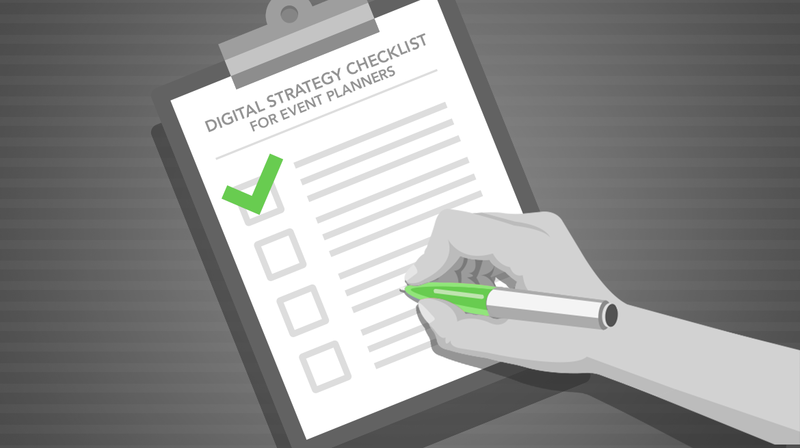 Successful events are executed by following checklists for AV, catering and now it is essential to include digital strategy. Pre-event needs include establishing a website, social media profiles, hashtags and email content. During the event, organizers want to post highlights as they happen, employ social listening and answer any questions in real-time. Regular reminders to attendees to use the hashtag and share content are also helpful. Post-event, thank you messaging can be communicated via email and social, data collected can be analyzed to improve future events and clips and content should be preserved for future marketing efforts. If you’re an event expert and you’d rather concentrate on the newest food and beverage trends instead of your digital strategy, partner with your company’s digital team to oversee this essential component. If your company’s digital team doesn’t have the bandwidth to take on yet another project, give us a shout…we love helping to create a good party! Andrea Serie is a marketing consultant for DoubleDown.Digital, a 360 digital marketing agency. She supports distinguished personalities, small businesses and startups with their digital footprint, including social media. Prior to joining DoubleDown, Andrea spent over a decade in corporate communications working for AIG and MetLife. She graduated from Lehigh University with a BA in Journalism. Andrea currently resides in Brooklyn with her two young sons.